BIRTH AND BAPTISM OF ST. MOGUE. Saint Killian, on a day of the days missed his oxen which he pastured at Fenagh in Cavan, and set off in quest of them. He came up with them on the edge of Templeport lake, standing without a stir, and looking steadfastly at the island which lay in the middle of the sheet of water. The ferryman's house was near the spot, and he asked the wife if anything remarkable had happened in the island during the night. She said that a strange woman had got herself ferried across to it, and had been delivered of a fine man child. Moreover the bedpost which she had grasped in her pains had sent roots into the ground; and from its top had sprung branches in full leaf and flower, and gone through the roof. "Where's your husband and the boat?" said the saint. "At the farther side of the lake," said she. "Bring out something, on which you may go across to the island for the infant, that I may baptise him." "There is nothing on which I could sit or stand but the hearthstone, and sure that would not do." "Well, try it." "But sure I couldn't lift it." "Make the attempt." She did so, and the flag was no heavier than a thin dry board. The saint placed it on the water, bade the woman get on it, and spread out her shawl to catch the breeze. She obeyed, and had a delightful sail to the island. There she received the child from Eithne its mother, brought it to the saint, and he baptised it by the name of Mogue. 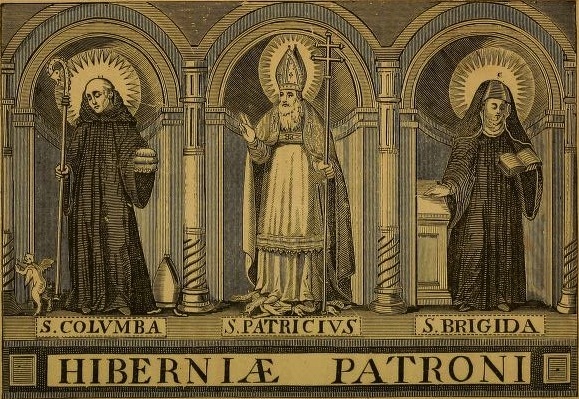 The woman then re-conveyed it to the island to its mother, and in time he became a priest, spent some time with St. David in Wales, and during the later years of his life governed the Bishopric of Ferns in Wexford. The miraculous hearthstone afterwards conveyed many a corpse to its place of interment in the island. Patrick Kennedy, The Fireside Stories of Ireland, (Dublin, 1870), 127-128. Note: For a full account of the life of Saint Mogue see a paper by Bishop P.F. Moran here.